The idea of using multiple images to create one better image isn’t new on smartphones. Google Photos will automatically stitch images together to create a panorama. OnePlus has a camera setting on the OnePlus One where the camera app would take a series of shots and combine them in a single high res image. SuperFuse uses this basic concept and spits out a single image with less noise and greater clarity. The app works best if your camera app has burst mode as then your clutch of images will match up better. 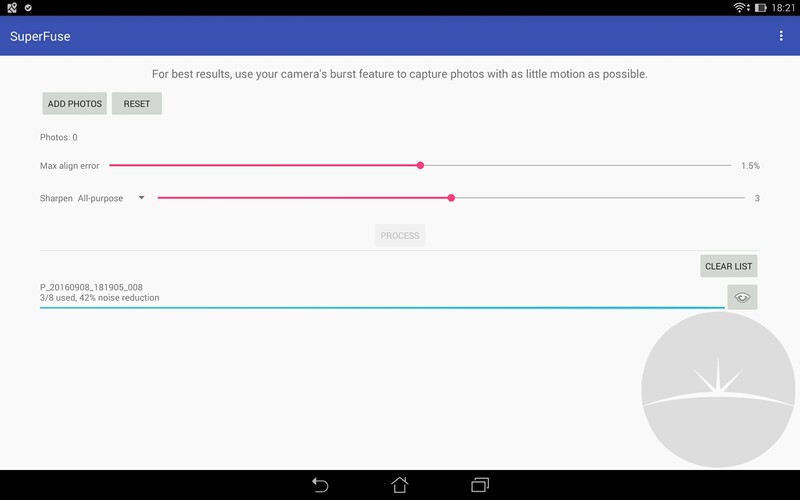 If your native camera app doesn’t support it, many on the Play Store will assuming your hardware can. Once you have have your batch of images you simply feed them into SuperFuse and let the app combine them into a new image. If you are using an older device or something with a sub par camera SuperFuse could really make a difference. One of the devices I tested on is an old Asus tablet with a poor quality 8mp camera and the results were a vast improvement. All of the examples shown have the original at the top, HDR in the middle if used, and the SuperFuse image at the bottom. If I have a complaint it’s the boring interface and inability to select more than one image at a time. You can however select them in your gallery or file manager and use the Android sharing intent to send them as a batch to the app. Images are saved with the same physical size, but use notibly more storage. If you are using a modern device I’m not sure the price is justifiable for a single function app, but I can definitely see the value for those on less acomplished hardware. If you fancy trying SuperFuse out there is a free version on the Play Store which will blend a maximum of 3 images.